The official blog for K. Sean Buvala, storyteller and storytelling coach. Synopsis: Award-winning speaker coach and storyteller offers new training workshops in the West Valley of the greater Phoenix area. Adults who use public speaking in any format are invited to register for the “Ancient Secret of Public Speaking” workshops in October or November 2008. Avondale, AZ- Improving and mastering public speaking will be the results when those in any career field attend the newest two-day training workshop offered in the West Valley. The “Ancient Secret of Public Speaking Workshop” has two remaining sessions in 2008: October 9 and 10 and then again November 6 and 7. Presented by long-time Arizona resident and national presenter, K. Sean Buvala, the workshops are limited to a few students per session to insure personal attention. For more information and to register, please see the website at http://www.ancientsecretworkshop.com . Sean has decided to keep this national workshop in the Phoenix area. “We’ve been offering a variety of workshops here in the west valley for about a year now. We have had attendees from all over the U.S. With this new workshop, we’re expanding our offerings so that anyone of any skill level can come and learn to speak with greater clarity, getting their message to stick in the hearts and minds of their listeners. As a side benefit, we’re creating business for west-valley hotels, caterers and retailers.” says Sean. 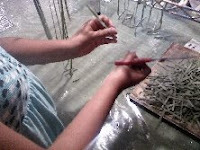 For the latest information and updates, please visit the website at http://www.ancientsecretworkshop.com. 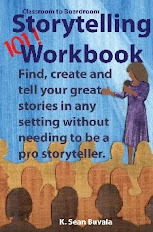 New Lower-Price offer on the Storytelling 101 Kit! More pics from the Marketing Boot Camp. A few pics from the "Outside In Storytelling Marketing Boot Camp #2" held August 15-17, 2008 in Glendale, Arizona. I give in! You wanted the OISBCamp Telecourse Workshop.....You got it! No travel, no hotels. Just five weeks of focused learning. First come, first serve. This one will fill up. *The early-bird catches the free coaching, too. 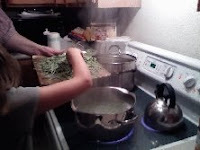 Took a day off last week to create some soup with my helpers, daughter #4 and cousin #3. 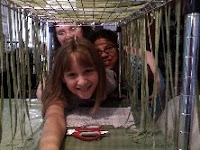 We made spinach noodles, vegetarian soup and chicken soups. Since I tend to think in narrative and story, I kept being reminded of the STONE SOUP story. Here's an audio version in the podcast from the ACT!VATED STORYTELLERS There is some background information at WIKIPEDIA but like many wiki entries there, not everything is correct. I am pretty hard -pressed to find a Grimm Brothers' version of this story. I think it is better traced through stories from Eastern Europe in variants such as "nail soup." If you have not made home-made noodles before, then let me guide you. Follow the pictures above. 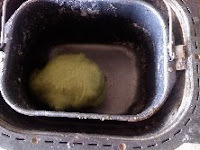 You'll first need to create the dough, consisting of flour, spinach, eggs and olive oil. We use a hand-cranked pasta machine that requires more hands than one person has. We end up with four long stretches of flat noodle dough. These are then run through the other end of the machine to cut them. When they are cut, some of them still stick together and get hand-separated by the assistants. As they lay on the drying racks, they become a tunnel of noodles, as you can see here by the spelunkers. 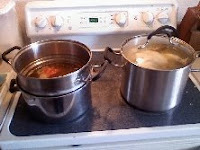 While the noodles dry, the soups are attended to. You can see our two pots of soups going at it in the pictures above. 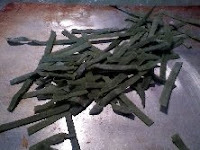 Once the noodles dry, it is time to cut them down to size. They can stay long, but for soup we trim them down with kitchen scissors. There's a picture of the pile there. 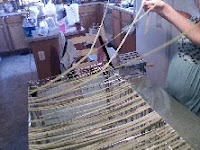 After a little more drying, the noodles go into the pot of boiling water just as any pasta would be cooked. Noodles made this way cook very quickly, about 3 minutes vs. the 8 for packaged product. As you can see by the last picture, noodles must be slurped to really get the full effect. Making noodles is a time-intensive process and will be an occasional treat at our house. Cost-wise, we're looking about the same as packaged pasta although the flavor is decidedly different and better. 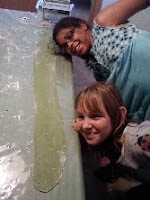 However, the memory-making and education/learning components of doing a project like this with children is above and beyond the discussion of cost and time. So, want to connect story to lesson planning? 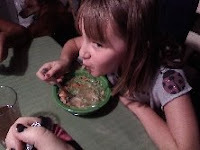 How about stone soup created in the classroom? How about noodles created as part of the that process? Stone soup and spinach noodles. Now, there's a story.